Illumination Entertainment has a few critical duds under its belt, but the production company struck gold with its 2010 supervillain comedy film Despicable Me. The story of Felonious Gru and his band of little yellow minions spawned a sequel that grossed over $970 million worldwide, and a Minions spinoff is set for release next month with Despicable Me 3 planned for 2017. To Illumination's credit, the studio isn't planning to lean entirely on the Despicable Me franchise. There's another Dr. Seuss adaptation in the works and next summer will see the release of an original film called The Secret Life of Pets, an animated comedy based around the premise of what pets get up to while their owners are out of the house. The first trailer for The Secret Life of Pets has now been released and shows the furry residents of a Manhattan apartment building getting up to no good. The voice cast includes Louis C.K., Albert Brooks, Kevin Hart, Jenny Slate and Ellie Kemper, but there's actually not a lot of dialogue in this trailer, which instead heavily emphasizes the film's physical comedy. The Secret Life of Pets seems poised to tap into the section of people's brains that compels them to watch endless animal videos on Youtube, especially those where pet owners strap GoPros to their animals or set up hidden cameras in order to find out how pets really behave when they're not being watched. It will be interesting to see whether the premise works as well in an animated family comedy movie, but this is a promising first trailer that saves its best joke for last. The Secret Life of Pets was co-directed by Chris Renaud (Despicable Me) and Yarrow Cheney. This is Cheney's first time directing a feature, but he previously worked alongside Renaud as a production designer on Despicable Me, The Lorax and Despicable Me 2. The screenplay was written by Illumination veterans Ken Daurio, Brian Lynch and Cinco Paul. Despite what the trailer suggests, The Secret Life of Pets actually does have a plot, which involves Max (Louis C.K.) facing competition for his territory when his owner brings home a mongrel called Duke (Eric Stonestreet). It might sound a little bit too similar to Toy Story, but this is nonetheless a really cute concept that could be an enjoyable experience for both kids and adults; the under-10s can enjoy the silly antics of the animals, while their parents will be able to appreciate the familiar voice cast. 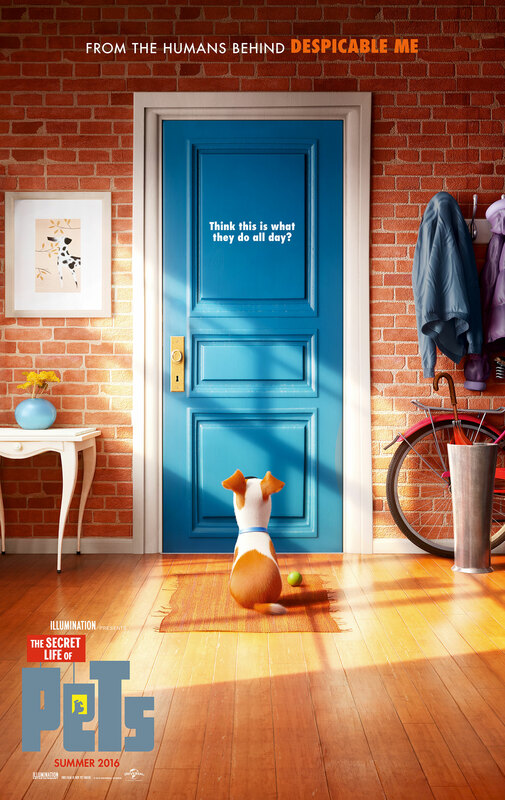 The Secret Life of Pets will arrive in theaters on June 8th, 2016.